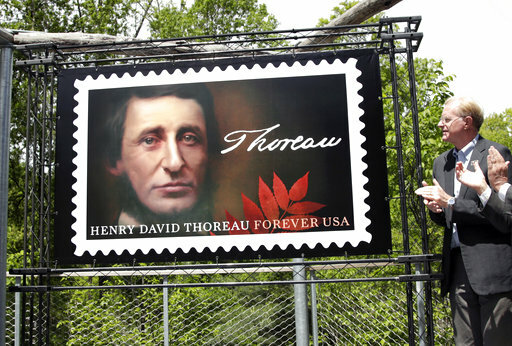 “`In observance of the 200th birthday of the iconic Henry David Thoreau, the United States Postal Service is marking the occasion with a new postage stamp honoring the Walden and Civil Disobedience writer, philosopher, and naturalist. The poet was born in Massachusetts, on July 12, 1817. “`Fans are gathering at Walden Pond, where Thoreau lived and worked, to read aloud from Walden, and other classics. Concord Postmaster Ray White, and officials from the Thoreau Farm and Birthplace, will be on hand to dedicate the stamp. They say it will be in tribute to Thoreau’s personal example of simple living, his criticism of materialism, and the timeless questions he raises about the place of the individual in society. “`Last May, actor and environmentalist, Ed Begley Jr. (above), a board member of Walden Woods Project, was at a dedication of the Postal Service’s new Thoreau postage stamp at Walden Pond in Concord. “`As Thoreau observed: You must live in the present; launch yourself on every wave; find your eternity in each moment. For the present… Let us remember the eternal Henry David Thoreau. This entry was posted on Wednesday, July 12th, 2017 at 12:01 am	and is filed under Blog by Manny Pacheco. You can follow any comments to this post through the RSS 2.0 feed. Responses are currently closed, but you can trackback from your own site.